Inder Loves Folk Art: Oliver + S Building Block Dress. Oliver + S Building Block Dress. Happy October, readers! As usual, I am a little bit in denial of the change of seasons - we've had some gorgeous weather this past month, and I'm not ready for autumn! But, ready or not, here it is! We've been really busy lately, finally working on the massive backyard overhaul I hinted about earlier this year. The whole yard has been graded, terraced, and new patios are in! It's super exciting, and such. a. big. project. Maybe I'll do a whole post about that soon? If it wouldn't bore you to tears. And if you're okay not having an obvious "after," because it's a work in progress, and I don't mean that in a humble-brag way, like, "see my gorgeous perfectly curated living room? oh, it's still a work in progress ... " I mean that in the "it's still a construction site" way. It's a bit of a blank slate right now - we have so much planting to do. In fact, these photos were taken at a local California native plants nursery where Maggie helped me pick out several nice plants! I thought to myself, "let's go off site for a photo shoot!" But then the light was a bit harsher than I was hoping for an October mid-morning and the photos aren't the best. Of course, after this, Maggie had pizza and ice cream, with predictable results. So these photos will have to do! For those of you who only post truly lovely, well-lit pictures, how do you do it? Do you do repeat photo shoots when one doesn't turn out? Do you not let your children eat pizza? DISH. Anyway, sewing! Like many of you, when I heard about Liesl's new project for Oliver + S, Building Block Dress: A Sewing Pattern Alteration Guide, and saw some of the teaser shots, I was like "OMG TAKE MY MONEY. ... No, seriously, here is my money!" I just knew it would be awesome. 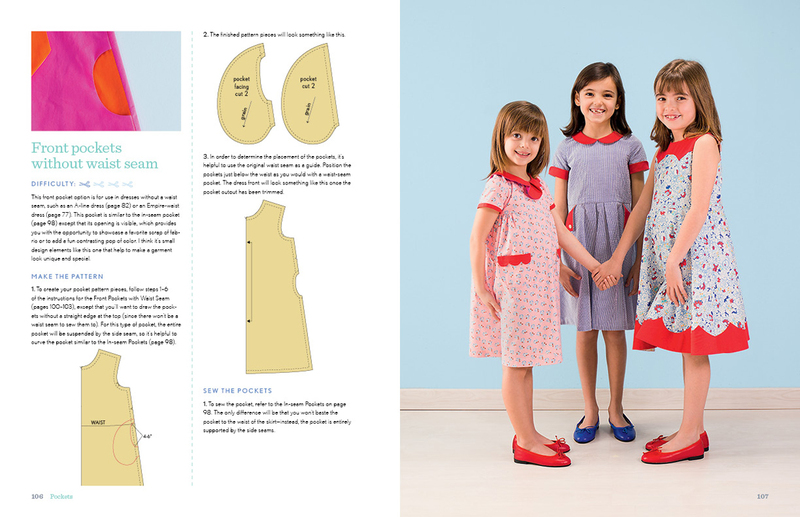 It's a book with a basic dress pattern and instructions for altering the dress to be whatever you want it to be. Although information about pattern-making exists out there in the universe, and I even have a couple of books about it, I have always been pretty hesitant to try those techniques in any serious way. It is pretty intimidating stuff. And I didn't have a basic "block" to start with (I realize any number of patterns could be used in that way, but you know - mental hurdles aren't always rational). But I knew that Liesl would explain it in a way that is especially clear, and the Oliver + S community is an amazing resource, which helps too. My hope was to learn and practice some skills that could be used on all kinds of patterns - not just girls' dresses - but I figured, if nothing else, even the basic block dress is pretty sweet! Incidentally, I want to say I think it's really cool that Liesl and Todd decided to self-publish this book. Liesl talks about that decision here. With all the Oliver + s patterns I've bought and used over the years, the things I've learned from the blog, the Oliver + S community, all the friends I've met on Flickr and the forums, who really form the basis for my blog audience (THANK YOU, GUYS! ), it was a no brainer for me to support Oliver + S in this way. I am a strong believer in supporting my local fabric stores (and small online stores) and favorite indie designers when I can. We all know that sewing is not a cheap hobby (especially the way I practice it, ahem), so I like to think that my money is helping nice people who provide great service or products to make a living wage. So anyway, the Oliver + S crew definitely put themselves out there, financially and otherwise, with this self-published book, and took a significant risk, and I was delighted to show my support. Also, this explained the long period without new patterns from Oliver + S, which had had me a bit worried. Well, I preordered the book, and it arrived a few days later, after I had had a brutal and long day at work (I can't even remember now why it was brutal, because I've moved on to new firefighting exercises, aaaggggghhh). I parked myself on the couch with a beer and started reading it. So good! It really got my creative juices flowing and put me solidly in my happy place. You've heard it by now, but the photographs, instructions, and illustrations are just wonderfully organized and helpful. Liesl has a rare gift for developing clear instructions, even on quite a large scale, as in this book. The weekend after it came, I dropped everything, scoured my fabric stash, and came up with this mock-up for my first try, a dress for Mags. This was a first draft - a few things changed in the making, most notably, I decided to go with a "gathered pocket" instead of a lined pocket. The style is decidedly "feedsack vintage," and was inspired by the fabric, from the Cotton + Steel "Lucky Strikes" line, called "Clothesline Floral Red." The selvedge reads "Tuesday Night Ladies Bowling League 1972," otherwise known as Right Up Inder's (Bowling) Alley, right? Heck yes. As usual, the design process involved Maggie, who helped me go through my fabric piles and chose fabrics and lots of loud and clashing trims and buttons. I actually have several pieces from the Lucky Strikes line, and Maggie originally selected "Coffee Shop Red," but I only had a yard. Me: "Maggie, I love that one too but I don't think it's enough fabric for a dress." Maggie, patiently explaining: "Mama, you have to cut it into pieces." There was additional negotiation, but we finally settled on the other piece of Lucky Strikes fabric, this lovely subdued, somewhat autumnal floral (the other piece will make a great little blouse or A-line dress). Having decided the fabric, I designed the dress. I decided to complement this lovely subdued floral with some purple lawn, also from Cotton + Steel (I think! ), which I decided to use for the collar, lining, and accents. 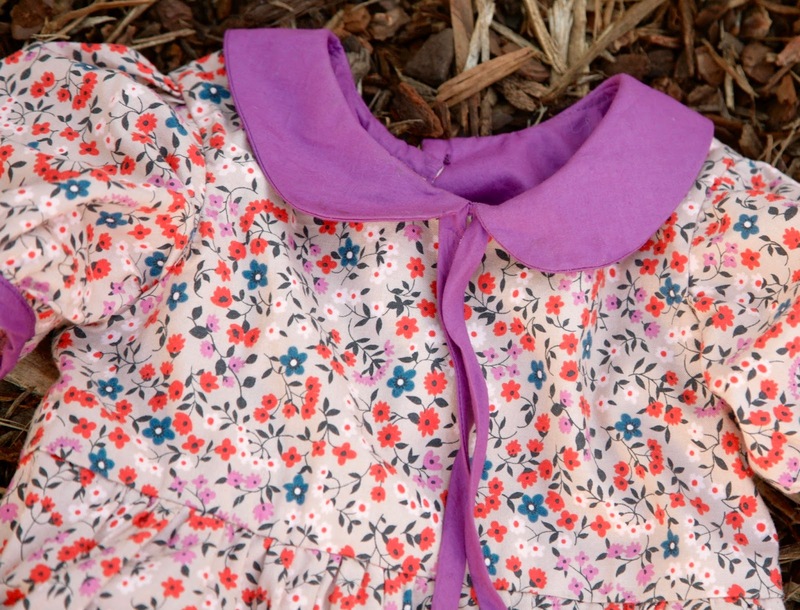 The inspiration to use a darker color for the collar came from the sweet little pink dress with the red shaped collar in the book. I have been obsessing over puffed sleeves lately and knew right away I wanted to try those! 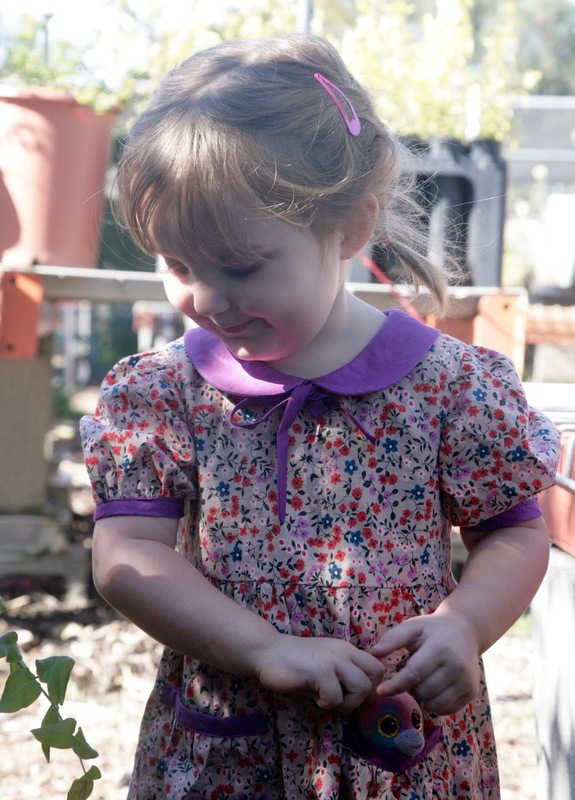 My love for sweet heirloom details persists over the years, and Maggie will only be "puffed sleeves" age for a little while, I must take advantage! For my first attempt at the dress, I decided to keep the bodice untouched, so that I could check basic fit before branching into a-line shapes. This is a size 3 with no modifications, and the bodice fits Maggie pretty perfectly, with a little room to grow. I also kept the peter pan collar, but decided to add a little tie made of a bias tube for additional interest. I stitched this to the neckline slightly outside of the seam allowance, so that you can barely see where it meets the collar. I spent the morning tracing the block pieces and making the alterations to the pocket and sleeve, following the instructions in the book. The instructions for altering the pattern were, as always with Liesl's work, excellent and clear. One little tidbit I got from the book is to use washi tape when you are "slashing and spreading" a pattern piece and need to secure it to another piece of paper to trace it. The washi tape picks up easily (painters' tape would work just as well), allowing you to adjust and fiddle until you're ready to trace. Both the gathered pocket and the puffed sleeve involve a good deal of cutting and slashing, and this trick worked really well! 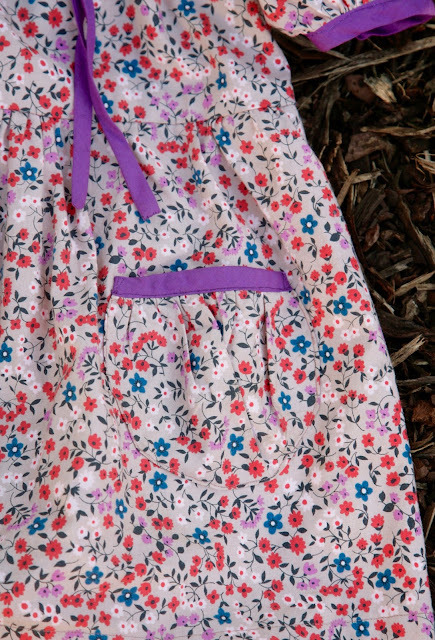 The pockets are the same little gathered pockets as you find on the Jump Rope Dress. They are not very visible in this busy print, but they are the perfect size for holding Maggie's beloved tiny Beanie Boo, "Baby Uni." I want to pause and say that I really love sewing from patterns. While I have changed out many pockets, changed shapes or lengths of items, and even drafted a collar stand, a lot of times I'm looking for a more brainless comfortable sewing experience. I want someone else to do that work, and I just want my hand held. While there has been some talk about Liesl "selling all her secrets," I don't think any pattern makers are going to go out of business on my account! I will continue to buy patterns. But I think this book will give me more confidence to adapt patterns to fit my desires, rather than getting a good idea or seeing something on Pinterest and then searching the interwebs for a pattern that matches it, only to be disappointed that I can't locate anything quite fitting my dream. In addition, a book like this can help you understand the whys of sewing - why do certain pieces look the way that they do and how does that translate in a final garment - that I am sure I can benefit from. 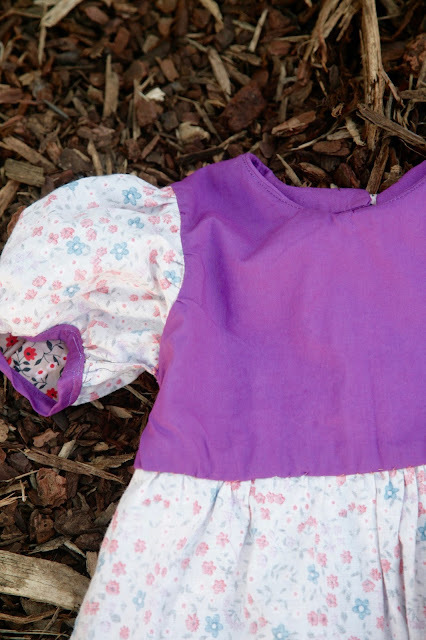 The bodice is lined in the lawn, for neatness and to add a softer layer next to the skin, since the floral is your basic kind-of scratchy quilting cotton. I did one extra technique that was not covered in Building Block Dress book, and sewed the lining and body with the sleeves sandwiched between while they were still flat, much like you would for a flutter sleeve (it's quite a bit more tricky). This idea - no joke - occurred to me late at night as I was trying to sleep. That's a sewing obsession for you! The next morning I was scouring the internets to see if it would work - here is a tutorial that I reviewed to make sure I wasn't completely off base for that. After all that, I did french seams on the skirt and sleeves - or, I should say, I tried to do french seams on the sleeves, but it it was not quite possible due to the fact that I had sewn the lining right up to the seam allowance of the sleeve (I am having a hard time describing the problem!). I am going to have to keep trying and tweaking this lined bodice with sleeves technique to figure out how it all works together! I hand sewed the bodice lining to the skirt, which is my favorite technique for an invisible finish on the outside, and I machine-sewed a deep hem. Four navy blue buttons down the back, a little continuous placket on the skirt, and all in all, it turned out pretty close to my design! Very vintagey and a little bit autumnal. This book is so fun! I am excited to keep working from it and try some braver alterations. As for Maggie, she lovers her pretty new dress, and is already working to help me design the next dress, which will be from a knit. Maggie wanted to make sure I didn't get stuck in a rut with this Building Blocks concept, so yeah ... jersey. Wish me luck! And here is Maggie with Baby Uni and Star, the baby dolphin. What about you, dear readers? Do you have this book yet? Are you making clothes for your kids this fall (spring for you Aussies)? Do your kids love Beanie Boos and stuffed animals? Can you make a dress from one yard of fabric if you just cut it up correctly? Discuss. Ahhhh, it's adorable! 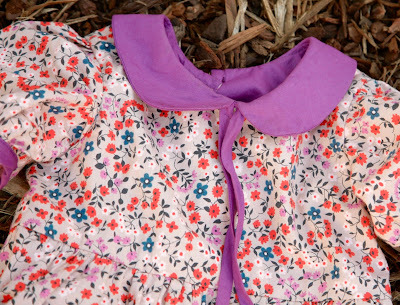 I love all the little details - the collar, the pockets, the buttons down the back! It's really lovely...and, holy smokes, Maggie's so big! How did that happen? Oh it's so so so so cute!! Great fabric combo, and I know what you mean about being subject to the 4 year old's whims. Stick with her, she'll come out of it at some point, haha. :) Isn't the book so great, too? I know I'll use it more to alter existing patterns to fit my vision rather than start from scratch every time and never buy a pattern again. So grateful to Liesl for the resource. 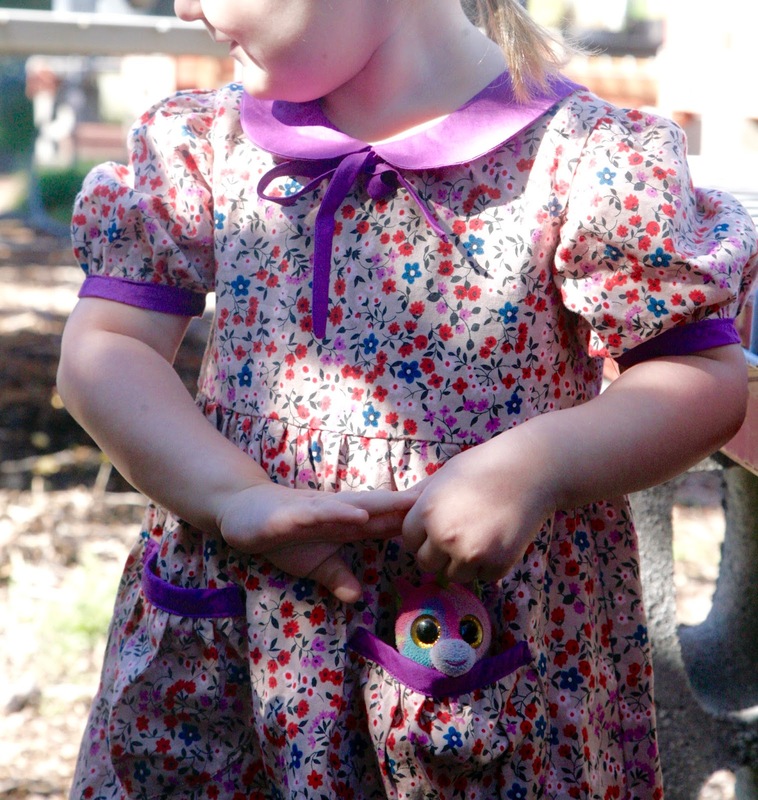 Lovely dress on a beautiful little girl! I love the vintage look. You did a great job! Your dress for Maggie is gorgeous and that is some serious sleeve puff action! I'd love to see your garden progress, but I do wonder how you'll manage to get the ironing board into the background of every shot this time round. This is so cute and vintagey-looking! And gah, Maggie in plaits!! The books sounds great but it wasn't even on my radar because, well, boys. 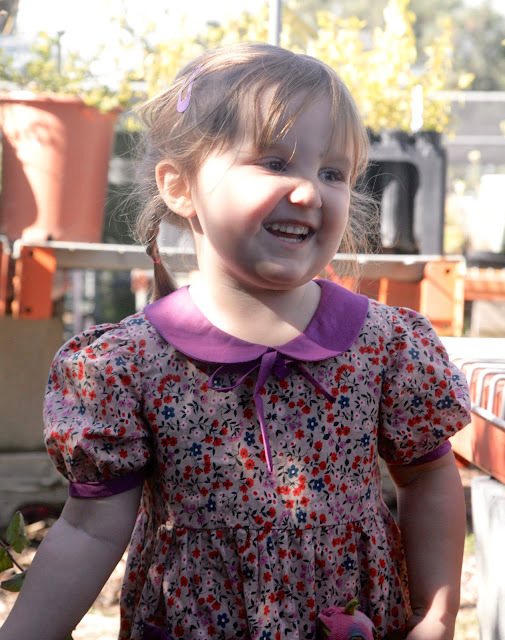 I hope to see more cute Maggie dresses though! Such a sweet dress, reminiscent of those lovely vintage sews of yours that I just adore. Oh Inder, there is so much to say about this post! Of course, first the dress! It's so amazing, and vintage/nostalgic. I love it. I feel like Maggie is looking more and more like you, too. Your backyard overhaul looks so awesome from the photos on IG. And your humble brag comment made me laugh out loud! 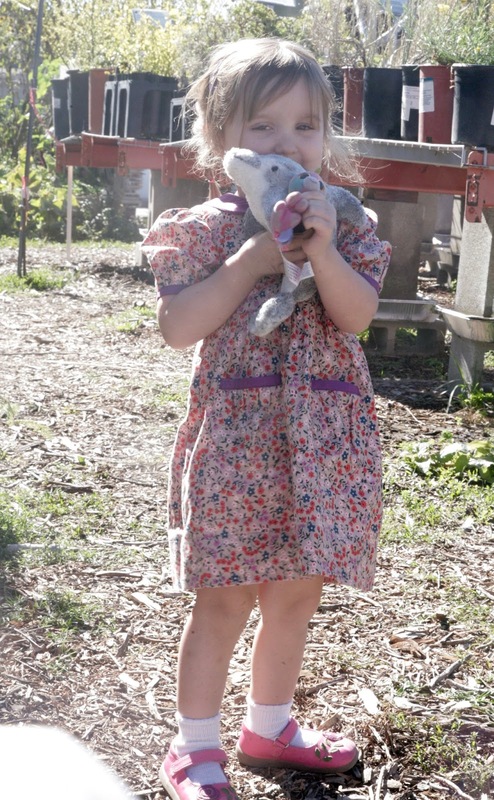 Now I often need 2 yards of fabric when sewing for my girls and this last dress I made for Indi required 3! Don't ask how much that cost given the fabric I was using. I'm definitely not sewing for thrift anymore! This dress is so Inder and so Maggie! I am dying at her dead pan "Duh, Mom, you have to cut it up!" The wisdom of a child sewing beneficiary. This book is on my Christmas list because I know that it will be awesome. But I much prefer sewing from a set pattern than mish-mashing my own up. Mostly because I rarely take the time to think things through and I tend to have to pause in the middle wondering how exactly I'm going to put in that collar or finish that sleeve. That said, there are those rare occasions (like once every 18 months) where an idea pops into my head and won't leave until it has been sewn, and then I'll be happy to have the book. Oh Maggie, you are gorgeous! PS I emailed you but it bounced back, I have sent you my email via FM, do you mind emailing me? Look at you with your notebook and swatches! That, to my mind, is what "real" sewing looks like. You know, all planned. The dress is gorgeous and so is Maggie! My mind always goes to white for Peter Pan collars; love this reminder of how amazing a bright colour looks on a contrasting collar. New to your blog. But don't worry, I have read through the extensive archives. ;p. There is just so much that I relate too. Seriously, I am super impressed by how much sewing you get done while working full time and having two your kids. You are inspiring me.Thanks! I am super impressed by how much sewing you get done while working full time and having two your kids.